 → Community → News → Many thanks to speakers and visitors at Euretina 2018! Many thanks to speakers and visitors at Euretina 2018! 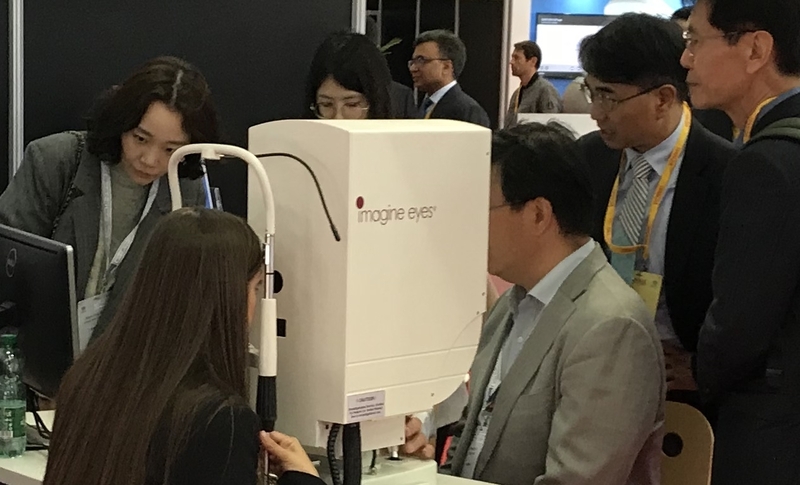 Imagine Eyes’ team wishes to thank all the congress attendees who visited our booth at the Euretina 2018 meeting in Vienna last week. We hope that everyone enjoyed our live demonstrations of cellular resolution retinal imaging, as well as our new high-precision follow-up functionality. We are also very grateful to Pr Masayo Takahashi (Kobe Eye Center, Hyogo, Japan) and Pr Kiyoko Gocho (Nippon Medical School, Chiba, Japan) for presenting clinical results obtained with the rtx1 Adaptive Optics Retinal Camera. Pr Takahashi showed images of induced pluripotent stem cells (iPSC) transplanted in a patient suffering from advanced AMD. The rtx1’s ultrahigh-resolution enabled a longitudinal analysis of the spatial distribution of these iPSC cells in a delimited region of the transplant. Pr Gocho presented a case of foveal hypoplasia caused by a new gene mutation. The rtx1 enabled quantifying the photoreceptor mosaic and showed reduced cone density throughout the macula. Click here to read more about the rtx1 AO retinal camera. https://www.imagine-eyes.com/wp-content/uploads/logo.svg 0 0 48design https://www.imagine-eyes.com/wp-content/uploads/logo.svg 48design2018-10-02 12:15:082018-11-14 20:02:21Many thanks to speakers and visitors at Euretina 2018!